Given a new organizational strategy, executive team changes, and global shifts in the ways museums engage guests, our client knew that making investments in the executive team was the first step to optimizing the organization for its future. 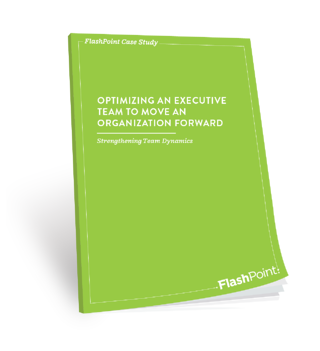 With the proven and practical applications of The Five Behaviors of a Cohesive Team™ the executive team implemented substantial enhancements to the ways they work. Through self-assessments and a leadership retreat, the team clarified major roadblocks, created a clear path forward, and readied themselves to move the organization through change. As one of the ten oldest and largest national cultural institutions in the U.S., our client provides an enriching, engaging, and interactive experience to more than 350,000 guests each year. FlashPoint facilitated The Five Behaviors of a Cohesive Team™ retreat to focus on key opportunities that create shared ownership and accountability for the organization’s new vision. The Five Behaviors of a Cohesive Team™ self-assessment: Each member’s assessment helps gauge the current strengths and areas of opportunity for the team. Customized retreat: A day-and-a-half experience centered on generating action based on assessment findings and driving shared ownership for achieving team goals. Reinforcement: A FlashPoint facilitator observes the team to encourage application, address challenges, and celebrate wins. Individual coaching sessions: Personal attention from a coach helps each team member set goals, commit to opportunities for growth, and remain passionate about achieving his or her goals. Progress assessment: After about six months, the team uses this assessment to measure team progress and growth. Team members showed nearly a 50% improvement in Engaging in Conflict Around Ideas, voicing their opinions even at the risk of causing disagreement. Around the area of Trust One Another (the core of effective teamwork) team members showed a 53% improvement. The team shows close to a 50% improvement in pointing out the contributions of achievements of others. Progress assessment demonstrated that team members have improved their ability to lead as a collective group and not as separate individuals. Team members willingly make sacrifices for the good of team success (and, by extension, for the success of the organization). Team members end discussions with clear resolutions. Each person takes personal responsibility for team successes and failures.